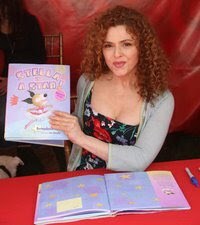 Bernadette Peters has written a new children's book! This time it's "Stella's Is a Star ", about a Pit Bull who tries to fit in. This effort, inspired by her own adopted Pit Bull Stella, is Bernadette's follow up to her New York Times Best Seller, "Broadway Barks ", which featured her other adopted pooch, Kramer. Bernadette again has written and performed a companion song to go with the book - "Stella's Song". On Monday, May 3rd, Bernadette will read and perform "Stella Is a Star" and "Stella's Song" at at Dylan’s Candy Bar (1011 3rd Avenue at 60th Street) from 3 to 5 PM. After she will sign copies of the book. A portion of the proceeds from the sale of this book benefits Broadway Barks. Broadway Barks was founded over ten years ago by Bernadette and Mary Tyler Moore and raises funds to to promote pet adoption and no-kill shelters. During the afternoon, $10 raffle tickets will be sold for a chance to win a walk onstage with Bernadette Peters and Mary Tyler Moore at Broadway Barks on July 10, 2010! Following the book signing, Bernadette will select one lucky raffle entrant as the winner of the walk-on appearance at the 12th Annual Broadway Barks Adopt-a-thon. The selected winner need not be present at the time of the drawing to win. Be sure to tell her where you'll be a week from today! If you go to this and am able to get an extra signed copy, please let me know. I'll obviously won't be able to make it on Monday :( Just let me know.